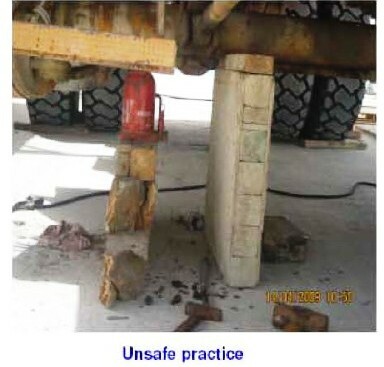 The above photo shows unsafe act or practice during maintenance work of heavy equipment in a workshop. Apparently, there is no proper or standard safety arrangements in place whatsoever. Number of pieces of wood served as support is broken, substandard and unstable. Jack was being used and is not suitable for the job. There was no evidence that a tool box talk was conducted and that the specific risks associated with this activity were acknowledge and properly explained to the operatives involved. It was then identified that there is no supervisor or person in charge monitoring the said activity. Situation has become worst, it was also observed that the operator/driver stayed at the cabin during the maintenance. But so far, there were no reports on major accident or fatality on this such type of unsafe activity. Main contractors must take note the following points and immediately review safety procedure or standards involving such type of maintenance. Any activities that involved such maintenance of heavy equipment must adhere in accordance to the contractor's approved HSE plan. International or local standards must be applied or to be referred on such type of activity. Use standard or proper support pads that would hold and distribute the weight of the load properly. Support jack that is to be used must be standard as per required on such activity. The main contractor must ensure that all workers are inducted before they start work on the project. At this level of risk, maintenance regime are to be in placed, safe method of work to be introduced and training to be developed and implemented accordingly. Risk assessment must identify the safe system of work and be communicated normally to the workers involved in the operation through tool box talks. Close monitoring and maintain proper supervision on such type of activity. Avoid driver or operator staying on the cabin during the time of maintenance.